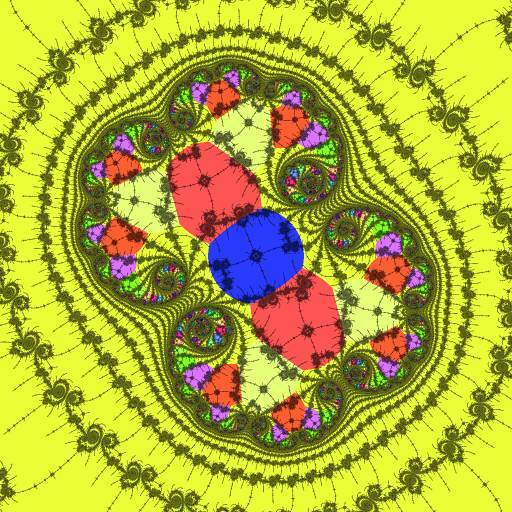 SuperFractalThing: Arbitrary precision mandelbrot set rendering in Java. Welcome to Fractal Forums > Fractal Software > Fractal Programs > Announcements & News > SuperFractalThing: Arbitrary precision mandelbrot set rendering in Java. Re: SuperFractalThing: Arbitrary precision mandelbrot set rendering in Java. Can you give the location parameters? I had a similar problem and that was due to the scaling and the limitation of the double datatype, which should not occur until about e600 if you are scaling the variables. The location was in the text file attached. To this post, I've attached the text file with the coordinates for the image I linked to. My above E-300 inner loop has 8 adds and 7 multiplies (I *could* make a third, "was smaller than E-300 originally" version with 5 adds by dropping the delta-zero term which will be negligible in these cases; and 2 multiplies and an add are needed to calculate radius for bailout, or I could drop to 5 multiplies and 7 adds) and my below E-300 inner loop has 4 adds and 4 multiplies. If anyone has optimized this loop to remove more multiplies I'd be curious to know how. I am kind of thinking that you could achieve a speed-up of factor 2 by going to SSE2, and a speed-up of factor 4 by going to Intel AVX. But I don't think software built on top of a Java VM has that kind of low level access. My program is able to zoom beyond this. And yes, it is very time consuming due to the huge number of iterations. I recall now that the problem I had was that the location just did not get updated, so maybe it is not relevant. I would like to ask you again, why the coefficients, why equation (3), (4) and (5)? I am only using equation (1). I create tables with all the delta-values, and when the zoom-level is above e300 the ap-library has a parameter for stripping zeroes when converting to double. The variable m_nScalingOffset is an integer, and m_nScaling is a double. These variables are actually applied for all zoom levels, however I have not noticed any performance difference. The standard mandelbrot function is calculated with the ap-library for the reference point, by default the middle point in the image to be rendered. Each value is stored as a double in arrays m_db_dxr and m_db_dxi. All other variables are the ap-library, except i and nMaxIter. I hope this can also help Pauldelbrot. What is "Series approximation" that my app is lacking? Unfortunately I still haven't got the SFT java app working on my machine, so I have never tested it. It would be nice if someone could do a comparison on the performance. I suspect that there isn't any big difference, since Java, or any language, would not add any overhead on simple arithmetic with hardware datatypes? version you get the formulas 3) TO 5). This approach is very interesting indeed. I can't say I understand it well yet but in theory it promises huge speed ups compared to the traditional approach. Coming back to your question. The "series approximation" is (2). Formula (1) for delta(n+1) is exact, but uses delta(n) which makes it recursive and expenisve to compute. Formula (2) for delta(n) is an approximation since it ignores all terms with delta(0)^m, 4 <= m <= 2^n. O(log n) time. A huge speed up for large n.
I have some questions as well. - The reference point should be in the Mandelbrot set or at least not go to infinity till the maximal iteration allowed for the image is reached, right? At least for all points using it as reference. How is this point found best so that the distances for all the points/pixels in the image remain small enough? Should it best be in the image itself? If not, how far can it be away till we get precision issues when using doubles only? - What to do when (2) does not converge fast enough with A, B and C alone? Fallback on (1)? Search a new and better reference point? - Does a Cn term << the Bn term guarantee that all the other terms are "irrelevant"? What should the minimal size difference be? Thanks a lot, it is so obvious when you point it out to me! - The reference point should be in the Mandelbrot set or at least not go to infinity till the maximal iteration allowed for the image is reached, right? At least for all points using it as reference. Yes. If it's a periodic point that's a bonus, because if the period is say P then the coefficents for the approximation (eq. 3-5) are eventually periodic, and I think it works out that the approximation is good until about 2P. Furthermore you only need to compute P X_n at high precision for the later eq1 iterations, because they repeat after that. How is this point found best so that the distances for all the points/pixels in the image remain small enough? Should it best be in the image itself? If not, how far can it be away till we get precision issues when using doubles only? Define the partials as each n such that |X_n| is less than |X_m| for all m < n, starting with n = 1, X_1 = C.
Then if P is a partial of a point C, Newton's method can be used to find the centre of period P, which is likely to be a good reference point. The problem is that if you have an image with lots of different C, they might have different partials, and (so far) the only way I found to compute partials accurately is with full precision iteration. (Using eq1 for partials fails at the same places that the reference point isn't good enough, namely deep embedded Julia sets). A reference point outside the image could be a good one, provided you have enough bits of precision to distinguish neighbouring pixels in the delta. A formula "G" involving the distance of a pixel from the reference and the distance between neighbouring pixels could be worked out. (2) should be good until about 2P, but only for points that have P as a partial. Each coloured region would have a different best reference point - depending on the formula "G" mentioned above the outermost yellow region might be ok for the whole image, but for deep embedded Julia sets it would fail, and the innermost blue region wouldn't be a suitable reference for most of the image. Interesting to read this thread. I discovered and implemented this same perturbation technique in the engine for KPT Fraxplorer in the 1990's, allowing it to do zooms to about 10^300. (You can still find this software sold for PC as part of Corel's KPT Collection.) The trick (as you've discovered) is to try to find the deepest point in the window to use as the high-precision "central orbit" around which the double-precision perturbations are computed. For deep M-set zooms, the central point will ideally be in a mini-Mandel, if there is one. Deep zooms containing multiple significant-sized mini-Mandels are problematic, though the minis tend to get sparser (relative to their sizes) as you zoom deeper. If you blame Windows or the hardware you are usually very wrong, but this time I really think I found a bug, and it's more probably in Intel's CPU than in Windows. Between e300 and e600 I am using scalinig and that works fine when I tested the 32-bit version of my program. But when I tested the 64-bit version, it does not work from e451 (or something). It is the exact same code, just compiled with different options. I need to investigate this further, to be sure that it is not because of me. But it seems that precision is lost when multiplying and dividing with a large value of format 1eP (where 151<=P<=300) - by 64-bit code and not by 32-bit code - in the same machine and processor. 64-bit code use SSE2 per default (which means 64-bit of internal precision for doubles), while 32-bit code use x87 FPU (which had 80-bit of internal precision) per default. Try running with fp:strict (or is precise?) (http://msdn.microsoft.com/en-us/library/e7s85ffb%28v=vs.80%29.aspx) and see if the output matches. Microsoft's C++ compiler does not support 80-bit fp anymore since at least VC5. So no, I don't think this is the case here. All versions of VC++ for x86 supports x87 FPU instructions (which means 80-bit registers may be used for intermediates). Even Visual Studio 2012 (where /arch:SSE2 became default), will emit x87 instructions: "...As a result, your code will actually use a mixture of both x87 and SSE/SSE2 for floating-point computations. " Syntopia, thanks a lot for this info, I will investigate this further! When running this on VC++ 2008 (x86) with default settings, I get equal results, as expected since x87 registers have 15 bits of exponent. When running this on VC++ 2013 (x64) with default settings, I get a zero for the product. SSE registers only have 11 bits of exponent (standard doubles). The default settings for VC++ 2013 has changed, but when running this on VC++ 2013 (x86) with "/arch:IA32", I get equal results, and with "/arch:SSE2", I get a zero for the product. But, as the docs state, the compile will choose as it seems fit whether to use SSE2 or x87 in this mode. Running with strict fp, does not change this behavior, which is rather interesting. According to the docs, the strictness seems to be only enforced at function calls. Now, since you cannot force a 32-bit program to only use SSE registers, and you cannot make a 64-bit program use x87 registers, I guess that means you cannot create programs (in VC++ at least) that will guarantee the same results on both 32-bit and 64-bit? And what about other languages, as Java? I wondered about that as well, since we use 32-bit and 64-bit Java code at work for scientific calculations. According to the JLS, if you use the 'strictfp' keyword: "Within an FP-strict expression, all intermediate values must be elements of the float value set or the double value set, implying that the results of all FP-strict expressions must be those predicted by IEEE 754 arithmetic on operands represented using single and double formats. " As I read this, Java calculations (with strictfp) must be exactly equal on all platforms.